Data released today by the Canadian Real Estate Association (CREA) show a second consecutive dip in home sales across much of the country. Rising mortgage rates and tighter mortgage qualification rules have hit first-time homebuyers particularly hard, and activity was pulled-forward late last year in advance of the new OSFI rules. Existing home sales dropped 6.5% nationally in February, deepening the decline that began in January. February’s sales figure posted the lowest monthly reading in nearly five years. Home purchases over the first two months of this year plunged 19.4%. Sales fell in almost three-quarters of all local markets, with out-sized declines in and around Greater Vancouver (GVA) and Greater Toronto (GTA). On a year-over-year (y/y) basis, activity slumped 16.9% from the peak pace of early 2017 and hit a five-year low for any February. Sales activity last month was 7% below the 10-year February average. Judging from price trends detailed below, the decline in sales in both Toronto and Vancouver appears to be almost entirely in higher-end single-detached homes, as the mid-range of the market–mainly condo apartments and townhouses–remain active. Ottawa and Montreal have held up better than most, with sales little changed from a year ago. Elsewhere, sales in Calgary and Edmonton were down from the prior month and modestly from a year ago. But, most metrics still point to a soft and relatively stable market, ignoring the OSFI-related swing. On a month-over-month (m/m) basis, three-quarters of housing markets experienced a decline in sales with just two provinces, P.E.I. (+2.98%) and N.B. (+0.79%) posting gains. B.C. led the declines, down 12.7% m/m, with the GVA down 15.8% and Fraser Valley down 16.3%. Calgary (-8.6%), the GTA (-8.2%) and several Greater Golden Horseshoe markets including Hamilton (-12.1%) and Oakville (-8.8%) were also down sharply on the month. The number of newly listed homes recovered 8.1% in February following a plunge of more than 20% in January. Despite the monthly increase in February, CREA reported that new listings nationally were still lower than monthly levels recorded in every month last year except January and were 6.4% below the 10-year monthly average and 14.6% below the peak reached in December 2017. New supply was up in about three-quarters of local markets. 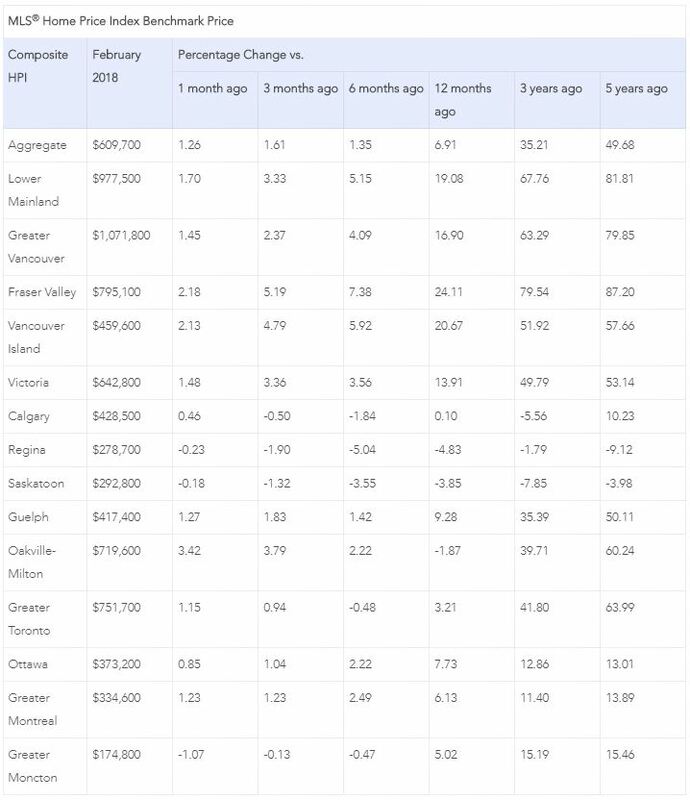 B.C.’s Lower Mainland, the GTA, Ottawa and Montreal led the monthly increase. Despite the monthly rise in new supply, these markets remain balanced or continue to favour sellers. With sales down and new listings up in February, the national sales-to-new listings ratio eased to 55% compared to 63.7% in January. Based on a comparison of the sales-to-new listings ratio with its long-term average, almost three-quarters of all local markets were in balanced market territory in February 2018. There were 5.3 months of inventory on a national basis at the end of February 2018 – the highest level in two-and-a-half years and in line with the long-term average of 5.2 months. On a national basis, the Aggregate Composite MLS Home Price Index (HPI) rose 6.9% y/y in February posting the 10th consecutive deceleration in y/y gains. This continued the trend that began last April when the province of Ontario announced its new housing measures that included a 15% tax on nonresident foreign homebuyers. The slowing y/y home price growth mainly reflects the trend for the Greater Golden Horseshoe. Prices in that region have stabilized or begun to show tentative signs of moving higher in recent months; however, year-over-year comparisons are likely to continue to deteriorate further due to rapid price gains posted one year ago. Nationally, condo units continued to show the highest y/y price gains in February (+20.1%), followed by townhouse/row units (+11.8%), one-storey single family homes (+3.5%), and two-storey single family homes (+1%). Benchmark home prices in February were up from year-ago levels in 10 of the 13 markets tracked by the MLS® HPI (see the table below). Composite benchmark home prices in the Lower Mainland of British Columbia continued to trend higher after having dipped briefly during the second half of 2016 (GVA: +16.9% y/y; Fraser Valley: +24.1% y/y). Benchmark home prices rose by about 14% y/y in Victoria and by roughly 20% elsewhere on Vancouver Island. In the GTA, benchmark price gains have slowed considerably but remain 3.2% above year-ago levels. While home prices in Oakville-Milton are down slightly over the past year (-1.9%), the monthly price trends there have begun to show signs of stabilizing with some tentative upward movement in recent months. Calgary benchmark home prices were flat (+0.1%) on a y/y basis, while prices in Regina and Saskatoon were down from last February (-4.8% y/y and -3.8% y/y, respectively). Benchmark home prices rose by 7.7% y/y in Ottawa (led by an 8.9% increase in two-storey single-family home prices). Greater Montreal saw a 6.1% rise y/y (driven by an 8.8% increase in townhouse prices). Benchmark prices increased 5% in Greater Moncton (led by a 6.4% rise in one-storey single-family home prices). Housing markets continue to adjust to regulatory and government tightening as well as to higher mortgage rates. The speculative frenzy has cooled, and multiple bidding situations are no longer commonplace in Toronto and surrounding areas. Home prices in the detached single-family space will remain soft for some time, and residential markets are now balanced or favour buyers across the country. The hottest sector remains condos in Toronto and Vancouver where buyers are confronted with limited supply. Owing to the housing slowdown, a general slowing in the Canadian economy and significant trade uncertainty, the Bank of Canada will continue to be cautious. As the Bank of Canada pointed out last week, household credit growth has slowed in recent months led by a slowdown in residential mortgage credit. Rising interest rates are a severe headwind for consumer spending, and tighter monetary policy could derail an already fragile economy. So don’t expect a Bank of Canada rate hike anytime soon.